Agendas are valuable when they 1) Help people prepare by giving them a chance to review documents, gather data, or get ready for a discussion. Almost no one does this. 2) Shrink the list of topics to discuss. If you have one person send an email, gather topics, compile an agenda and send it to the group without editing it, you’re better off taking the first two minutes to just whiteboard out the topics. Smart leaders use agendas to prioritize and focus group efforts. Almost no one does this either. 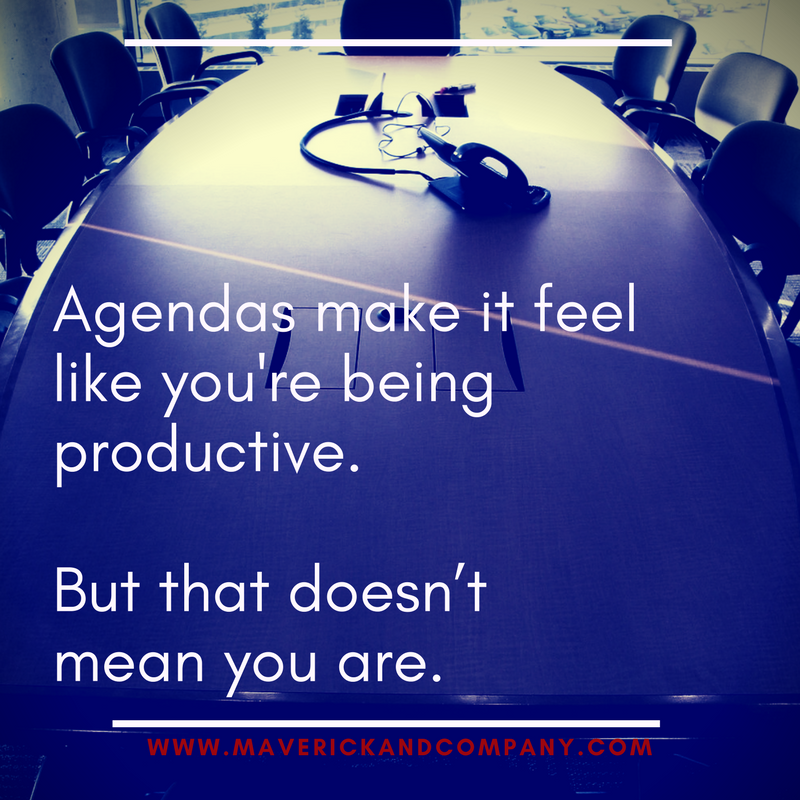 Instead of investing in agendas, work on defining your OBJECTIVE. Figure out, and write down, what the point of having the meeting is. Why are you calling people away from their work? What needs to be produced or achieved? What’s the OBJECTIVE? We hold a regular staff meeting in order to share critical information, victories and changes with the senior leadership team on important projects and to efficiently coordinate shared resources for the following two weeks. Project update meetings exist to provide top level updates to the entire team, identify upcoming challenges and problem solve to avoid/mitigate them, and to find ways to accelerate results and improve quality on each project every two weeks. Our weekly sales meeting is the time we celebrate great effort and results, share best practices, inspire healthy competition, provide short technical training and energize each rep and the team for the next week. Clear objectives help tell you what there is to actually do and know whether or not you’re getting it done. The more specific you can be, the better your meeting will become. 2) Train people to report. Sharing information is one of the easiest places for a meeting to go horribly wrong. When people give updates they tend to ramble because they are unprepared, there is no format, and often because they’re trying to tell a story to justify some kind of failure they’re embarrassed about or scared to admit to. We use a simple set of tools to keep track of major work projects and other important data. Team members update their sheets and review the team’s sheets in advance. The combination means the team doesn’t have to spend most of the meeting figuring out what is happening. They already know. Which means they can spend the time problem solving, working on new stuff or getting back to work. It is RARE to find a team that is efficient about sharing information. Even if you can’t implement the whole solution (with documents) training your people to come prepared to report, clearly and efficiently, can make your meetings dramatically less bad. Even small decisions involve risk. We risk being wrong, looking bad, making the wrong call and shutting down other options. In groups pushing for a decision means sometimes making people uncomfortable. It can mean upsetting people when their favored path isn’t chosen. People sometimes get upset when they’re told no. For many people, and definitely for many groups, it’s just more comfortable to keep talking, even though that too can be painful. Pushing for decisions is done well when you give people space to have a real, and robust discussion. Dig for concerns. Ask what the best and worst case scenarios are. Get data AND listen to your gut. But listen for the moment when people are recycling old comments. If there’s an objection that hasn’t been voiced, get it on the table. But if the only thing left to do is decide, resist the urge to keep talking or thinking. Make the call and then ask people to get on board and get to work. Great meetings, like most good results, do not happen by accident. Don’t just have a meeting. RUN yours to be intentional, productive, enjoyable and efficient. About the Author: Alecia Huck helps owners with good people build great leadership teams that can get work done. She helps them learn the block & tackle skills of leadership; how to hold people accountable, run great meetings, keep track of people and work. Alecia has expertise in both human behavior and process science. She often works with fast-moving entrepreneurs and in fast-growing companies, building skills and structures to help them scale without going corporate. Newer PostPeople Problems or Management Problems?